features to Improve guest service and property maintenance. Improve guest service and property maintenance. Be at the forefront of customer experience with VQuarters guest application. 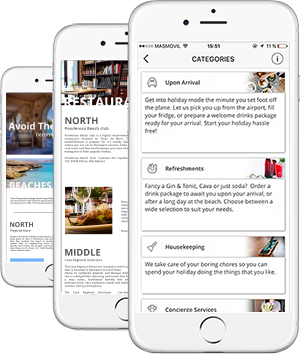 Your guests will receive access to your guest application, filled with your welcome book, travel guides and favourite spots. Provide all necessary property information such as manuals and contact numbers. Provide your tailor made services via your own virtual concierge app, to delight your guests at every stage of their trip. Easily add extra guest services & activities via the guest application to enhance their stay. Boost your revenues, get great reviews and win your guests’ loyalty. Yes that´s right! This is a white label application branded for your business. Send custom announcements to your guests, such as special offers or welcome messages. Save time and gain more control over your maintenance. Avoid misunderstandings with your workers and be sure everything is ready for the new arrivals. Avoid misunderstandings with VQuarters crew application where you manage all communication with your workers. Assign tasks, send directions and property information. Monitor the progress of work and comment directly on a task to clarify exactly what needs to be done. When the job is completed, you receive a picture confirmation to make sure everything is as you would like it to be. Controlling your maintenance jobs has never been easier. With VQuarter you have all tasks in one place. Create chat rooms around each job with notifications, worklists and workers. Reports for each property, task and worker. 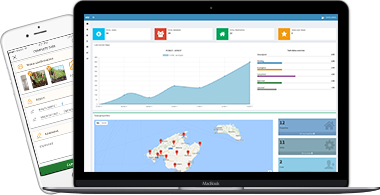 Manage tasks, workers, guests and properties from your back office. Create maintenance tasks, follow progress and communicate more efficiently. Send out custom push notifications with promotions and recommendations. Each time a booking is confirmed, the guest is automatically invited to use your VQ Butler application. Where they can access property information and order extra services. Our powerful API allows you to create units, import guests, add crew and service pricing, set taxes and fees, generate maintenance work orders. The data is yours. Don’t let your comfort level stop you from acquiring and maintaining properties, improving your guest experience and ultimately generating more revenue.